Until recently, modern travellers on the road from Gandía to Albaida would pass by a magnificent building set back a little north of the road and wonder what it could be, and what secrets it held. Since May 2005 the doors to this building, the Monasterio de San Jerónimo de Cotalba, have been opened to the public and we can now visit to admire its interior and gardens and learn about its the long and varied history. 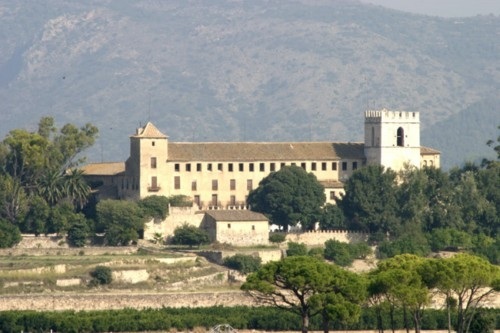 The monastery has been the property of the Valencian merchant and business Trénor family since 1843. It was declared as an item of cultural interest (BIC) in 1994 and is now in the process of being restored and enhanced for visitors and as a location for concerts and private functions. Interestingly, the monastery has its origins in Xàbia, where in 1374 Pope Gregory XI authorised its foundation to some hermit monks. Unfortunately they were attacked by pirates in Xàbia and in 1388 King Alphonso of Aragon bought some land from Muslims in Cotalba away from the sea and gave it to the monks. The monastery building is still used by the Trénor family especially during the summer months, but visitors are welcome on Thursdays and Saturdays. A guided tour, of about one and a half hours duration, includes an interesting 20 minute introductory film (available in three languages, Valenciano, Castellano and English) which highlights the historic episodes seen by the building from its time as a monastery; how it was supplied with water from a 5km aqueduct; how it was loved by poet Ausias March, how it came under the protection of the dukes of Gandía, of its fall into disrepair after the 19C confiscation of church property, of its use as a military hospital during the civil war, how the Trénors created the gardens and planted them with exotic trees brought from countries with which they traded, and thus to modern times. The film adds an overview to the tour which is provided by a highly knowledgeable guide, who, in addition to describing the various styles of architecture, divulges interesting pieces of information which do not appear in the guidebooks. For example the layout of such monasteries always have their entrance, and that of the church, facing south, while the monks' sleeping quarters always face east to catch the early morning sun. Visitors are shown the hidden (and forbidden) female figure in the fresco of the Last Supper painted on the wall of the dining room; and told that there are frescoes under the white plaster inside the church, but that it would take skilled, and expensive work to uncover them. Although the monastery is open from 11.30 It is best to phone first to confirm times and say if you want a guided tour. If visitors prefer an English speaking guide they only need to phone before hand to make arrangements. Location: Autovía Gandía-Albiada (CV60) 46275 Alfahuir (Valencia). Signposted from the main road. Alternative access via Rótova.